Saturday, October 22. At 5am, Fort Bonifacio was still dark and quiet. Being the first to arrive meant I was all alone for a while. I began to wonder whether I went to the right place so I took a stroll outside of BHS and searched for other people. Not far away, I found a small race all set to go. I played the curious onlooker and leisurely visited the booths. 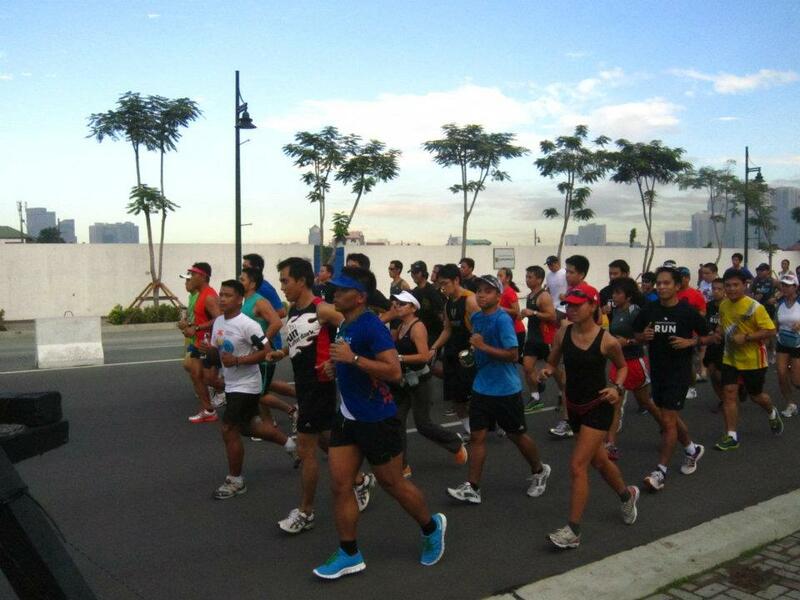 When I join running events, everything happens in a blitz and I seldom have the time or energy to walk around. This was a nice change of pace, literally. People started tricking in when I got back to the meeting area in front of Krispy Kreme. The organizers were setting things up, hauling stuff from their mini-truck. Light slowly filtered through the clouds and I was just giddy to get things started. It was amusing to see them rolling out Sun 3G tarps with Jaymie as the model. Talaga naman. Celebrity na. While stretching, I accidentally hit a girl who was coming up from behind. After profusely apologizing to each other, we got to talking and so I met my first TBR friend, Arzen. 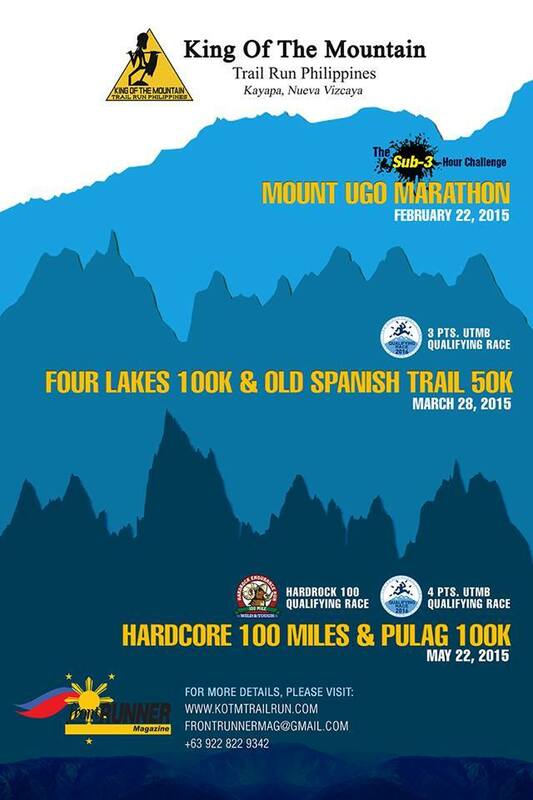 TBR Dream will also be her 2nd 42K as we apparently both ran in the recent Milo Marathon. She’s a member of AdiNation Ayala and introduced me to some of her groupmates. I’ve always envied people who are part of running teams. I hope I can find one that fits me soon. And we’re off! I ran the whole route with my PF buddy Joyce. We were actually surprised that the coaches made us run since Jim Lafferty’s plan called for a 45-minute walk that day. Joyce was nursing shin splints and I was recovering from YABOI (Yet Another Bout of ITBS – yeah, boy!). They said we’ll do intervals of 3 minutes run and 1 minute walk. So we did, very slowly, and simply enjoyed it. The group run extended to almost an hour covering nearly 6K. 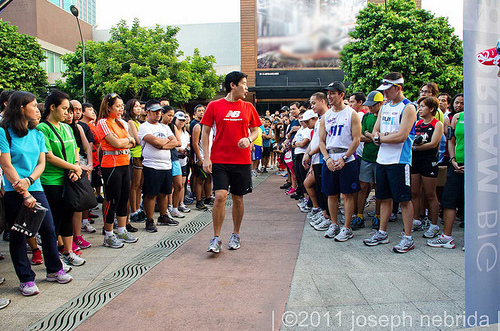 It was non-competitive as Coach Edward took the lead and it was forbidden to overtake him. Jaymie acted as sweeper all the way back. Since we didn’t care about the speed, we worked on perfecting our form and we must’ve been doing it right because Joyce ran in the Adidas KOTR the next day and got a PR – no pain at all. Woot! My running buddy Joyce "The Pissed Off Chick" and Jaymie "The Bull Runner"
Actor/director Gabe Mercado (“OK ka ba, tiyan?”) is part of our batch. He brought a camera crew with him to document the event and interview some of the runners. The film clips and stories will be made available at MoveForMove.org. It’s a cool site with inspirational content which I highly recommend. Dream Chasers were also on hand as volunteer pacers. They are TBR Dream Marathon alumni who have made it their mission to pay it forward by helping the newbies like myself. Hopefully, I’ll be able to join them for chaser duties when the next batch comes along. ‘Til the next Bull Session, guys! Dream BIG, run STRONG! I love how this shows a glimpse of the race day preparations. Even if it rained all day, everything still flowed smoothly and the runners enjoyed every minute. Hydration stations were well-stocked up to the very end. Thanks to Runrio for taking care of us while we were on the road. Another, um, motivational video (look at those abs!). The product of my search for Hope Solo’s workout pictures. Shot by the one and only Annie Leibovitz for Nike. Mmmm… sometimes it’s good to be alive. Enjoy! The business mantra “measure so you can improve” applies equally well to running. There’s nothing like real-time feedback on your speed and distance to keep you focused. You’ll know day after day how many miles you’ve added and how many minutes you’ve shaved off of your previous pace. This instant gratification is a great morale booster that will keep you coming back for more.